In case you are unaware, Seah Im food centre is located opposite to Habourfront. 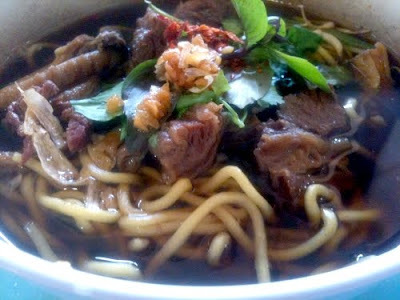 Thaksin beef noodles, as the name implies, sells halal thai style beef noodles in soup. This stall in Seah Im is the original stall and there is one more stall in clementi. The soup is flavoured with herbs and spices which is different from the usual chinese style beef noodles and there is no MSG added as told which is a plus point. 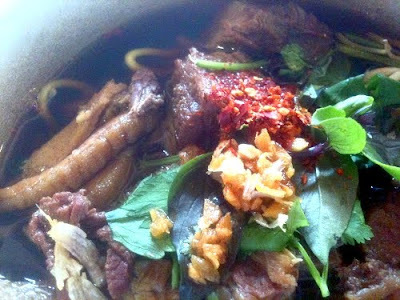 The stewed beef and tripe (stomach)are tender and not rubbery. If you are not into tripe, you can asked for the stewed beef pieces only. The beef noodles is garnished sparsely with kang kong, bean sprouts, thai basil and coriander. The vinegar chillie padi sauce is a little bit too sour for my liking and the grounded chillie padi flakes are extremely fiery, it burns literally.